Low Pay is Fine, as Long as You Walk Like a Model…. I was sorry to see that Senator Marty Golden cancelled his upcoming “charm school” event. Really. For those not from New York, Golden is a former police officer and ex-catering hall owner (his brother and wife now run the business) who until recently was the only Republican representing Brooklyn in the State Senate. His base is in Bay Ridge, which is also home to two other elected GOPs, Rep. Michael Grimm and Assemblymember Nicole Malliotakis, and Marine Park, where the barometer has moved to the right due largely to the influx of Orthodox Jewish residents. If you don’t know what he looks like, Golden is a white-haired fellow of Irish descent who wouldn’t have seemed at all out of place at Tammany Hall. He sponsors community events like free summer concerts and a hugely popular Halloween Walk in Marine Park. My kids still talk about the Halloween Walk, not because of the blood-dripping ghouls that popped out at them but because it was the day Marty Golden gave them each a Hershey’s Bar. Yep, it’s gonna be tough to get their vote. 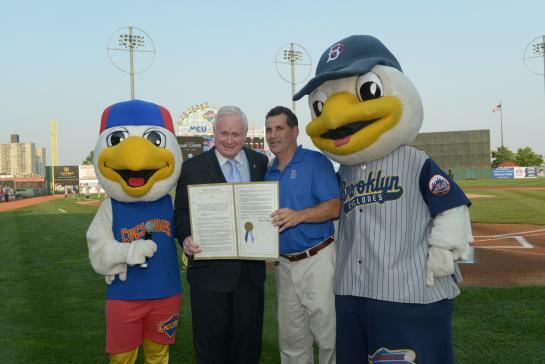 On Monday, at the height of the etiquette class furor, Marty Golden presented a proclamation at MCU Field in Coney Island honoring Gary Carter, the late Mets legend (see photo below). Wearing a dapper suit and smiling as he posed with Cyclones mascots Sammy and PeeWee, he wasn’t breaking a sweat — not from the 90-degree heat or from the criticism from the National Organization for Women (NOW) and just about everybody else that he was showing his true colors an out-of-touch throwback, and a wolfish one, at that. I wouldn’t want to show up at Golden’s door for a job interview. Full disclosure: I spent 18 years writing newsletters for another Brooklyn state senator. We had a few unintended gaffes over the years, like the prostate screening newsletter with the relevant anatomical illustration that offended some sensibilities in Borough Park. (A text-only “shlong mailer” went out the following year.) From experience, I can tell you that newsletters are usually created not by one person but by several. Ideas are bounced around among the elected official and staff. Once these things are written and a proof comes back from the graphics department in Albany, they’re proofread for errors. There’s always time to re-do something that looks funny or doesn’t read right. I’ll say one thing. If “walk like a model” passed muster with Golden and his staff, I can only imagine the other mail that’s gone out to the public. There’s a good chance I’ve been missing out on some entertaining stuff. The woman scheduled to preside over Golden’s so-called career development event was Phillipa Morrish, wife of longtime Bay Ridge community activist Larry Morrish, who was billed as a “Certified Protocol Consultant” — the capitalization isn’t mine — and president of a business called Etiquette Training International. Morrish’s business website (http://etiquettetraininginternational.com/) contains information about her finishing school and online classes, along with testimonials that are all from people in Guyana. The course module is rather eclectic. If “creating a positive first impression” and “wardrobe chic” aren’t enough for you, you might choose to explore something called “techno-etiquette.” What is that, exactly? Learning not to say “f–k” whenever you hit the wrong key? I really don’t want to know what “Gift Giving Home and Abroad” is, either, or what sort of gifts she thinks women professionals ought to be giving. Actually, I think Golden’s opposition to a minimum wage increase and his continuing belief that women should get paid less than men are more than enough reason to get him outta here. The etiquette class, while quaint, is offensive only because it’s gender specific. When my 18-year-old daughter was little, she attended a day-long etiquette class for both girls and boys at the Plaza Hotel. She and her friend Emily learned to eat french fries with a knife and fork. I thought it was a cute idea, and one with some potential usefulness in the real world. Maybe Marty Golden hasn’t spent enough time sitting next to men picking their teeth at lunch. Or maybe, as I suspect, he’s just an old-fashioned guy with old-fashioned ideas. And in his old-fashioned way, he was trying to help. Comb your hair, fix your make-up. Soon he will open the door. For wives should always be lovers, too. Run to his arms the moment he comes home to you. And men will always be men. With your hair still in curlers. You may not see him again. something you’d wear to go to the city. Pour the wine, start the music. Time to get ready for love. Pour the wine,start the music. Time to get ready,time to get ready for love.